MILLEDGEVILLE, Ga. – Freshman Denzell Hosch had ice water running through his veins in the closing seconds of Monday evening’s game at the Centennial Center, launching a 45-foot shot that found its way through the cylinder as time expired to give the University of North Georgia men’s basketball team a 66-63 road win over Georgia College. The Nighthawks improve to 14-11 on the season with a 10-6 mark in the Peach Belt Conference, just a half game behind Montevallo in the Western Division race. UNG led for the first 14 minutes of the game but the Bobcats went on a 18-4 run over the last eight minutes of the first half to take an eight-point lead into the intermission. After a bit of a slow start out of the half, the Nighthawks started to chip away at the Georgia College lead and eventually tied the game at the 1:11 mark on a Hosch free throw. After Isaac Thomas put the Bobcats back up with a layup, Shaquan Cantrell tied the game back up on a shot that was counted with a basket interference call on Georgia College. The Bobcats got the ball back with a tied game and just a six-second differential between the shot clock and the game clock. GC ran the shot clock down to the last second before firing off a contested three-pointer that deflected off the iron and into the hands of Ross Morkem who quickly found the hot-handed Hosch near half court. Hosch turned, took three steps and let the ball fly, finding nothing but net on the other end to hand the Nighthawks a pivotal conference road win. – Denzell Hosch led all scorers with 20 points on the night that included a perfect 9-for-9 performance from the charity stripe. Ross Morkem posted a team-high eight rebounds and added 10 points of his own. – Georgia College had two players hit the double-double mark in the game with Kohl Roberts scoring 16 points with 15 rebounds and Isaac Thomas putting up 16 points with 14 boards. – North Georgia earns the season sweep of the Bobcats with the victory after downing Georgia College, 64-60, two weeks ago in Dahlonega. 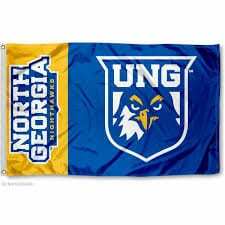 UNG is now 9-1 in their last 10 games against the Bobcats. – UNG keeps pace with Montevallo for the Western Division lead. North Georgia trails by a half game in the standings, but have played one less game than the Falcons. The two teams square off in Dahlonega on Wednesday. UNG defeated Montevallo on the road in January on a buzzer beater by Ephraim Tshimanga. The Nighthawks return to the friendly confines of Memorial Hall on Wednesday to take on Montevallo. Tipoff is set for 7:30 p.m.